Don’t get me wrong. I love my short hair. It takes two minutes to style, and I’m out the door before my snooze button even has time to go off. Plus, I hardly ever have to replace my shampoo bottle. But seeing how it’s a brand new year and everyone’s making their resolutions, I guess it’s time for me to start being honest. So, I’ll admit it: I was stuck in a major hair rut last year. I know, what’s so hard about styling short hair, right? Here’s what. It gets boring. I wear it the same way. Every. Single. Day. I’ve considered getting extensions, but like I said, I love having short hair. My problem is the styling. I’d love to try something new, but I have no idea where to start. So I decided to ask my stylist friends at Byu-Ti Salon for help. I told them I was looking for new 2012 hairstyles to stir things up and get myself out of this rut. In turn, they gave me some really cool ideas to try, and they even walked me through the step-by-steps for each look. Click here to see all of the hairstyles they showed me. When I got home that night, I decided to do a personal dare: a new style each day. There were seven of them, including two looks that scared me a little: the pompaudour and finger waves. But I had to at least try, right? 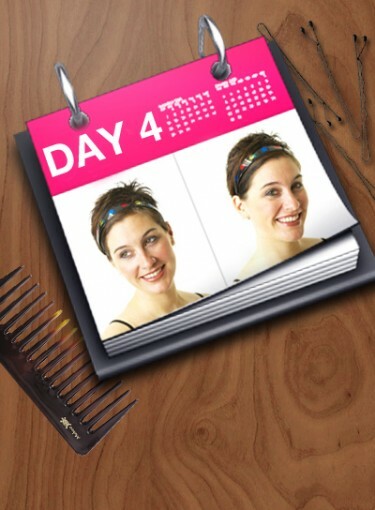 Keep reading to see the result of my week of hairstyles, and to get the hairstyle how tos the stylists shared with me.